Hello again! Welcome back to the Milk + Honey Travelers series. Read these real travelers' thoughts and trip summaries for a glimpse of what’s possible for you. Since I focused on Malta for the first Milk + Honey Travelers feature, today you'll see a trip in a different climate. Enter Debbie and Jack’s winter wedding anniversary trip to Switzerland. I built this itinerary to emphasize Europe’s ‘Old World’ charm during the two weeks over Christmas and New Year’s. Debbie worked for years in the travel industry. She and Jack have enjoyed international travel and cruising in the past. But for their 25th wedding anniversary, the couple decided to see what it was like to put themselves in someone else’s hands. From our first conversation, they were eager to embrace winter. Since they spend winters in Florida, celebrating Christmas under the bright, snowy Alps was special treat. The trip lasted two weeks and spanned Lausanne, Bern, Lucerne, and Zurich. They traveled by train. I arranged a concierge to handle their luggage by providing door-to-door service between destinations. Since Debbie is an adept traveler planner herself, this was her first time using a travel advisor. Like many of my clients, she found me first on Instagram. She and Jack got in touch once they realized the 25th wedding anniversary of their dreams would take more research time than they had to give. The hotel we stayed at in Lausanne was called the Beau-Rivage Palace. It literally used to be a palace. The hotel was so grand and old European with an amazing hallway of massive chandeliers. Outside, they had beautiful outdoor areas to sit with fire pits. It was cool how they do outdoor living in the winter there. There were fur pelts on the chairs and a blanket if you wanted to use it sitting outside. The terrace stepped down to a little hot chocolate shack by a merry-go-round. And there was a big long glass tube that was a champagne bar — little white trees with lights, white leather furniture, glass on every side. They only served champagne. In front of the pop-up Bubble Bar by Ruinart: A rolling green hill led down to a massive outdoor, heated swimming pool. Beyond that was Lake Geneva. On top of all that, every hotel we went to was magically decorated for Christmas. Very, very decadent, Old World decor. In one day, Debbie and Jack ascended Mount Pilatus by train, descended via an incredibly steep cog railway line, then boarded a day cruise through Lake Lucerne. After their descent, they boarded a cruise around Lake Lucerne, where they could enjoy sweeping views of the medieval city and surrounding Swiss villages. We had a guide at three of the cities. 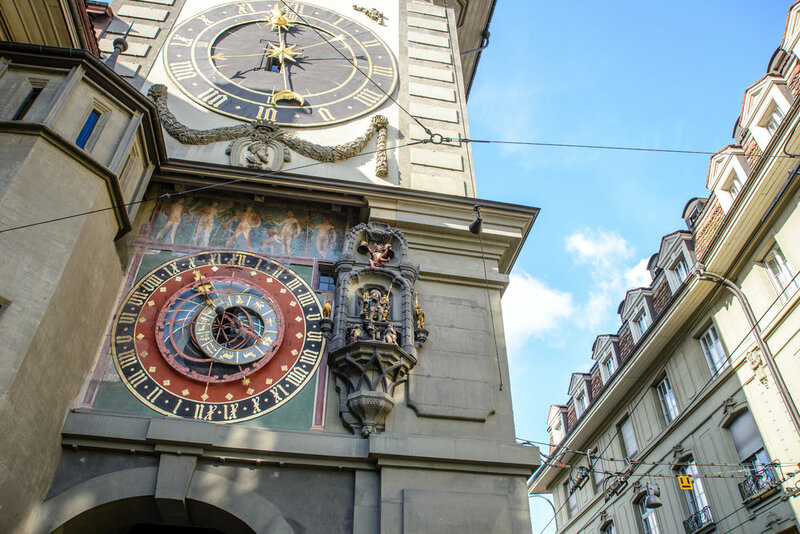 The tour guide we had in Bern, she happened to be a clock-keeper for the famous clock in Bern. On Christmas Day, she texted me and invited us into the clock, all the way up in the clock. As we were leaving the hotel, we told the bartender: ‘We’re going to wind the clock!’ And he’s like ‘Oh, really? !’ But he said all these years there and he’s never been in the clock. You had to wind all these different sections — the dancing bears, a crow, all these different mechanisms. We were inside with all the mechanics, pulling the strings. It was a really neat experience. THOUGHTS ON USING A TRAVEL ADVISOR? We joked that we're probably now ruined for life… having done it only once, I'm not sure we'll ever do a trip any other way! It’s the only way to go now! I don’t know what I would have come up with for it, but I certainly would have been shooting in the dark having never been to Switzerland before. When we arrived at the first hotel, we got an entire package from Brianna’s local connection, with luggage tags for every transfer, vouchers for certain excursions, a map of every city. It was a jackpot of information that added to the ease of having it planned, having the itinerary each day in the hotel. What a nice touch it was to get the box and itinerary. I still have the itinerary so I can look back and remember. Debbie and Jack are still deciding on their next getaway. I’m excited about creating another custom itinerary for them, but until then, what about you? If you have questions about Milk & Honey Travels or are interested in a luxury trip for yourself or someone you love, please get in touch.